For this year’s annual Golden Forks, we decided to shake things up a bit and shine a light on some of the area’s best restaurants by showcasing our favorite dishes broken into three categories: meat, seafood and pasta. The result is 31 polished plates that run the gamut of cuisine from Italian and New American to Indian and Japanese. We think you’re going to want to start making some reservations for your table now. This 12-ounce sirloin arrives to the table “sizzling” on a piping hot cast-iron skillet and would easily please any carnivore with its silky texture and succulent taste, but the garlic butter sauce basting the glistening meat helps put the dish in bright lights. The wildly popular Indian dish better known as “butter chicken” is certainly something special here. Moist chicken bathes in a multi-layered curry consisting of tomato and honey with a special black pepper blend. It’s enticing and overly fragrant, even more so when you add the accompanying basmati rice infused with saffron. We never miss an opportunity to dine here with visions of the crispy, candied brown duck skin in our heads. The light crêpes served alongside make the perfect vessel to add the protein along with the accompanying cucumber and scallions for a mouthwatering match made in heaven. Chicken is dipped in egg to create a slight coating and then rounded out on the plate with mushrooms, shallots and artichokes. Capers lend a hit of salt and a white wine lemon sauce adds acidity to help brighten everything. Filet mignon is one of the most-ordered cuts of meat in the world, appreciated for its luscious beef and trace amount of fat. And while Fleming’s has a worthy offering on their menu, we’re partial to this version that keeps the bone on the tenderloin while cooking to add even more of a buttery taste to every forkful. Light, airy crêpes are filled with an amalgamation of chicken, tomatoes, onions, raisins and almonds before being coated in a rich tomato sauce, topped with cheese, sour cream, pumpkin seeds and fresh avocado. It’s savory, a little sweet and undeniably delicious. This beef rib cloaked in a rich balsamic glaze is so tender you could probably stare at it and it would fall apart. A polenta made of a smoky gouda and Brussels sprouts are the perfect co-stars for this runaway hit. There’s great attention to detail taken in preparing these sliced cuts of veal that have been kissed by the pan and served with an array of mushrooms and a tantalizing sage and marsala cream sauce with mashed potatoes. Each component works harmoniously in order to make for a cohesive dish that you won’t soon forget. We love this combination of a veal cutlet with grilled eggplant as the two mix wonderfully together, especially when you add creamy mozzarella and finish the plate with a simple-yet-sophisticated wine sauce. Perfectly cooked veal is the foundation and it blends extremely well with milky mozzarella and a robust tomato sauce, before being finished with extra virgin olive oil. We’re suckers for stuffed chicken breasts and the alluring offering here is one of our favorites. The chicken is filled with prosciutto, mozzarella, spinach, mushrooms and sun-dried tomatoes before being coated in a vodka sauce. A fish selection not often seen on area menus, this sizable portion is served up with portobello mushrooms and tops a portion of garlic mashed potatoes with spinach, feta and lump crab, while being finished with lemon butter. Nearly 15 years since he opened his unmistakable front door on Haddon Avenue, chef Franco Lombardo continues to wow us with his creative spin on food. And it’s hard not to swoon for this red snapper filet that he sautées along with clams, mussels and calamari in an intricate seafood stock blended with white wine and saffron. The menu at chef Mike Stollenwerk’s seafood-heavy restaurant changes often to maximize freshness, but this recurring delight has been in his hall of fame since he manned kitchens in Philadelphia. Crowned with leeks, the buttery, flaky fish rests atop truffled spaetzle that is floating in a Parmesan-tinted broth. As a commercial fisherman, Bill Fischer’s fondness for high-quality seafood is apparent in every dish he composes. And never is that more evident than with this plate of risotto inhabited by day-boat scallops, shrimp from the Gulf of Mexico, middle neck clams, P.E.I. mussels and calamari. Sushi-grade tuna is evenly coated with sesame seeds and cooked to an ideal temperature of medium rare before being plated with Brussels sprouts and a unique Jersey tomato and wasabi salsa, that is both fresh and a little fiery. For decades, chefs have had a love affair with this versatile fish and the theater that came along with filleting it tableside. At Estia, their minimalist preparation of sautéeing the fish after dusting it in flour, helps play to its strengths by highlighting its sweet flavor. A sizable salmon filet is cooked skin side down to create a crispy exterior while the inside of the fish glistens with perfection before being rested on a carefully constructed bed of white beans, capers, arugula and blistered cherry tomatoes. A hit of lemon wakes up the ingredients to create a lingering taste of satisfaction. This grown-up fish stew boasts a championship roster of scallops, jumbo shrimp, cockles and mussels. But it’s the complex lobster broth that brings everything full circle and the fragrant saffron appeals to any gourmet’s culinary senses. Folks intimidated by Thai cuisine would be well-served to introduce themselves to the wonders of that culture’s cooking starting with these pan-seared scallops served with bok choy and broccoli and sauced with a dynamic red curry reduction. Skill and precision are synonymous with everything coming out of the kitchen at Yokohama, and that certainly rings true with this staple of many Japanese menus where grilled sea bass is paired with miso and garnished with micro greens. The high fat content of the fish helps keep it moist throughout the cooking process and the miso helps add to the melt-in-your-mouth effect. Run don’t walk for the chance to twist your fork into this pasta plate. The width of pappardelle noodles are just right for slow-cooked venison ragu. The addition of shaved dark chocolate may seem surprising but its presence takes the dish to new heights. Tagliolini (a ribbon pasta a tad thicker than spaghetti) is tossed with a special sundried tomato pesto sauce that is made in-house before being topped with roasted pine nuts to help give a balanced texture to every bite. This restaurant may be tiny, but chef/owner Joey Baldino has been doing big things behind the stove. Just ask the James Beard Foundation, which has nominated him four times for its illustrious awards. This dish of short, stubby rigatoni with eggplant, tomato, ricotta salata and basil breadcrumbs is just another reason to make a fuss over this place. 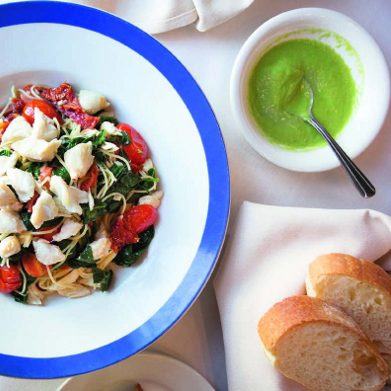 Meals at Tre Famiglia tend to be memorable and this desirable dish is no exception. Linguine is tossed in a smooth tomato-cream sauce with jumbo shrimp, meaty scallops and jumbo lump crab for good measure. The pasta is the perfect complement to the seafood which soaks up the sauce to add enhanced flavor. These ravioli are made on the premises to optimize freshness and come complete with a medley of wild mushrooms, spinach and salty pancetta. Make sure to get some extra bread to sop up the indulgent sherry cream sauce. This decadent dish reminds us of Sunday dinner, so be sure to bring your appetite when ordering this hefty portion of homemade lasagna filled with well-seasoned meat and silky ricotta, topped with gooey mozzarella and masked by a vibrant tomato sauce. A rustic, yet refined dish that evokes Old World tradition, Mama Filomena’s technique for handr olling gnocchi stands the test of time. The pillowy dumplings swim in a plum tomato sauce with fresh basil, Parmesan cheese and a finishing touch of EVOO. Tissue-thin pasta stuffed with creamy cheese is sautéed alongside diced celery that has been smoked in a deep brown butter with toasted almonds. The smokiness and the brown butter are a worthy counterpart to the pasta’s creamy filling and one of the reasons we want to keep eating this over and over and over.